IRVINE, Calif., Oct. 11, 2018 /PRNewswire/ -- Pasternack, a leading provider of RF, microwave and millimeter wave products, has introduced a new line of military-grade MIL-DTL-17 RF cable assemblies that are ideal for avionics, military electronics, satellite ground stations and autonomous vehicles. Pasternack's new series of military-grade cable assemblies consist of 124 basic configurations from six different cable types for a total of more than 700 part numbers that are all available for same-day shipment. These cables provide operating frequencies of up to 12.4 GHz and VSWR as low as 1.3:1 per connector. 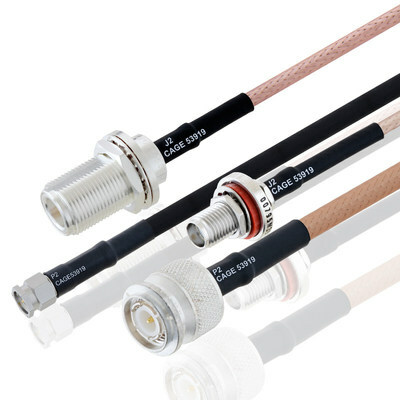 They are made from MIL-DTL-17 qualified cable, MIL-PRF-39012 qualified connectors, AS23053 heat shrink and J-STD soldering. The final commercial off-the-shelf (COTS) cable assemblies are 100% tested and include a test report, as well as material lot traceability. They are ideal for defense, aerospace and transportation industries or any place where the cost-of-failure is high. "We are excited o offer this new line of cable assemblies with such a high service level. In the past, customers would wait weeks or months for cables built to these specifications and with traceability. Now, they can select from hundreds of different COTS solutions and have the cables shipped same-day with test reports," said Dan Birch, Product Manager. Pasternack's new military-grade MIL-DTL-17 cable assemblies are in stock and ready for immediate shipment with no minimum order quantity. For detailed information on these products, please visit https://www.pasternack.com/pages/rf-microwave-and-millimeter-wave-products/mil-dtl-17-high-reliability-rf-cable-assemblies.html.